When Tyreik Donaldson entered Strawberry Mansion High School as a freshman four years ago, there was one thing he had to do. For three years, the Philadelphia school's choir performed concerts each holiday and grading period, and also gave special performances to celebrate the honor roll students. Located in a low-income neighborhood with a high crime rate, Strawberry Mansion is considered one of the most dangerous schools in the country. Last year, it was among the more than 37 Philadelphia schools that were scheduled to close this June because of lack of funding. The community rallied together to protest, and Strawberry Mansion was reprieved in February, but the poverty-stricken school district continues to struggle. When the school had to decide last year between a humanities teacher and a music teacher, the music teacher position was cut from the budget. When Donaldson returned for his senior year, the music teacher, and consequently the choir, were gone. But he wasn't ready to stop singing, so he took matters into his own hands and approached school officials about starting his own choir. "I wanted to keep that tradition alive," the aspiring singer and valedictorian said. The choir is a mix of seniors, juniors and sophomores who meet twice a week during school hours and perform songs of their choosing. Their favorite is the gospel song "I Smile" by Kirk Franklin. Donaldson takes music lessons outside of school and performs solo at weddings, so he uses his experience to lead the group, helping the six students with their technique and breathing. Before the choir, many of the students rarely performed on their own, much less with a group, so Donaldson also works to build their confidence. The principal has to approve each of the choir's performances for the school. Last Christmas, the choir performed for their fellow students and kids in town, and it is still one of the choir's favorite performances. "It brought back memories of how we used to do it [with a teacher]," he said. "It's good to bring it to the students." 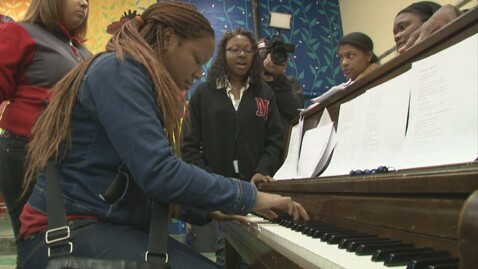 School officials said there is still not enough money in the budget for a music teacher next school year. Although Donaldson has led the choir since September, he said it could be even better with a teacher. "I may have some skill, but I'm still learning myself," he said. Next month, Donaldson will graduate and go on to college, although he's still deciding which one. But no matter where he ends up, Donaldson will bring the memories of his choir with him. "The choir means a lot," he said. "I have built a whole lot of relationships, friendships with the people that are in the choir. It has brought us closer together."